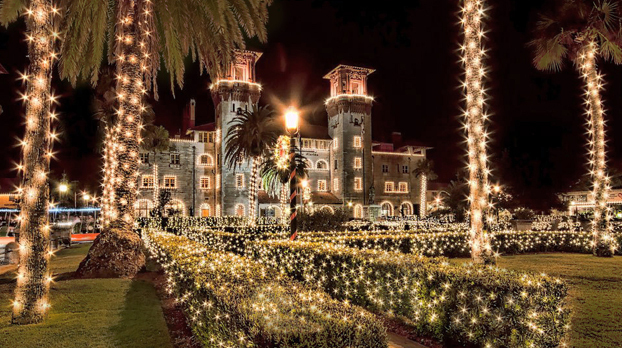 Every year, St. Augustine becomes more vibrant with our annual Nights of Lights celebration! If you’ve not yet had the opportunity to enjoy Nights of Lights, it’s time to set a few days aside, book a stay with us at Beachers Lodge, and prepare yourself for a memorable holiday experience! Amazing dining, sensational tours, endless entertainment, as our annual holiday event will keep you busy for several days! There are sights to see, places to eat, stores to shop, and amazing architecture to enjoy! The entire downtown area comes alive with the holiday spirit and offers ample opportunities to make joyous memories! Did you know we have been voted as one of the “Top Ten Places to See Holiday Lights”? From mid-November to the end of January, the historical downtown area of St. Augustine becomes a hub of holiday lights, music, and activities. Over three million lights shine throughout our downtown area, lining walkways, trimming trees, and enhancing the beauty of historic buildings. Stores and restaurants remain open later into the evening hours, giving you the opportunity to dine and shop under the holiday lights. There are several tours available for your enjoyment and transportation. You’re able to take in the sights on foot or by train, trolley, boat, helicopter, or horse-drawn carriages. Some of the local attractions offer hot chocolate and cool glasses with their tours. Check out their websites to find which fits your style. We recommend an invigorating walk or viewing the magic via horse-drawn carriage rides, after experiencing one of the many amazing restaurants in the area. Grab a cup of coffee, and leisurely stroll through the Plaza de la Constitucion, and savor the lights, the Christmas tree, the music, and the company of your friends and/or family. The Nights of Lights Celebration celebrates a Spanish Holiday Custom of placing candles in windows of your home to welcome the Christmas Holiday Season and to invite guests into their home. Our city commemorates this joyous holiday by lighting up the downtown area and turning it into what appears to be a “winter wonderland” of joyous celebrations. I use this term loosely as it is by far not winter-like conditions in our neck of the woods. Enjoy holiday songs as they reverberate throughout the entire area, offering the opportunity to sing or dance along. Candlelight tours offer a romantic walk, offering a more spiritual feeling to your holidays. There is even an ugly Christmas sweater pub crawl for those that love a great pub crawl. Have you heard of our Christmas light bandit, who will sneak in and switch out a white bulb for a colored one! As you meander around downtown, keep your eyes peeled for the occasional colored bulb (usually red) and the sneaky elf trying to switch it out for another one! So, go ahead and book your stay with us, pack your flip-flops and a hoodie, put your family and friends in the car, and head on down to downtown St. Augustine. Don’t forget your camera! The Nights of Lights will create memories that will be with you forever. No need to say “cheese,” as the atmosphere gives you a special feeling that makes you want to smile the whole time you’re here.